After Maya Moore struck a sponsorship deal with Jordan Brand, several women’s basketball sneakers has surfaced and another one is set to come out soon! 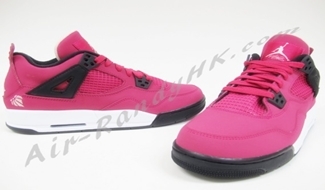 The Air Jordan 4, which is one of the most famous model among the Jordan numbered series, will be coming out in Voltage Cherry/Black-White colourway. Voltage cherry dominates the upper and sits on a white midsole and black outsole accented with the “For the Love of the Game” icon. This is one is good as gift this Holiday Season so watch out for it!